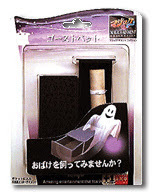 The magician displays a small plastic box and explains that a ghost lives inside. He slides open the drawer and shows the box to be empty. As soon as the box is closed, it suddenly starts to move atop the magician's outstretched hand, and even stands up without any visible support. Finally, the box opens all by itself, and a message from the ghost magically appears inside the previously empty drawer! At the end, you can show the interior of the box to your audience. There is nothing out of the ordinary to be found.